The current performance requirements of non-destructive testing vary greatly. Even though standard transducers obtain satisfactory results for certain applications, the evolution of the industry manager justifies more and more seeking out transducers designed to order. The issue is notably, to define at the earliest, and most accurately, the specific character of a set of objectives and constraints. Operation while immersed with an initial oblique incidence, for a water/steel plane interface. The anticipated acoustic performances are a focusing on a wide range of depths, of the optimal dimensions of the beam and good detection sensitivity as well as an optimal yield with the test assembly. 10 ring elliptical array type cut, cut out in sectors (Illustration 1a), nominal frequency of 2 MHz, 60% pass-band. The viewed ultrasound fields correspond to the amplitude distribution of the ultrasound beam in the part for a focusing depth of 20 mm in (Illustration 1b), and 150 mm in (Illustration 1c). These predictions permit us to determine the dimensions of the ultrasound beam and to check them against the desired dimensioning precision of the desired defaults. Starting with the specification elements obtained in this way (geometric description and cut of the transducer, nominal frequency and pass-band, damping, impedance adaptation, absence of acoustic and electrical cross talk between the elements of the array, pressure and temperature holding, associated interconnection technique) solutions which respond better to the desired functions have been considered. At this stage, the choices deal with the piezoelectric material, the acoustic adaptation and damping materials, the electrical adaptation and cabling elements, the determination of the dimensional parameters as well as the machining procedures, set-up and testing to be implemented. Here again, simulation tools are used in order to optimise the choices made : piezoelectric composite or passive design support tool, equivalent electrical circuits of transducers, radiation models of geometrical elemental surfaces. An example of a simulation result achieved by Imasonic is furnished in Illustration 2, which represents the impulse response and the frequency spectrum of the considered sensor modelled by an equivalent electrical circuit of a transducer. After manufacturing the sensor, a characterisation step is necessary in order to validate the design choice. Illustration 3 shows by example the measured impulse response of the sensor in transmission/reception mode on a reflecting plane target. Illustration 4 : Validation of the transducer in operating conditions : measurement of the field transmitted by the transducer. 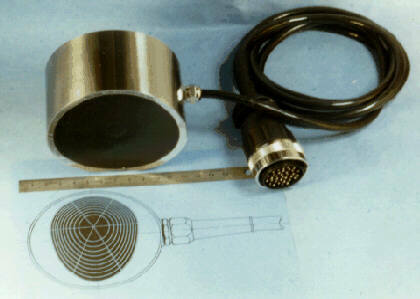 The transducer was then tested under operating conditions which were close to real conditions. Illustration 4 presents a comparison between the predictions of the ultrasound field given by the Field-Sound model and the measurements performed in transmission using an EMAT probe in contact with the outer wall. These amplitude responses correspond to the measurement of the maximal amplitude of the ultrasound field, in each displacement point of the EMAT receiving flux valve. The comparisons between theory and experience, carried out on blocks of different thickness' have shown an excellent accord and have permitted the validation of the whole testing procedure : test assembly and behaviour of the transducer in terms of acoustic and electrical response. Manufacturing customised ultrasound transducers, in technical and economical performance conditions, is an important issue in the progress of non-destructive testing by Ultrasounds. This activity requires a double innovation : technical innovation in order to have access to manufacturing procedures which are both flexible and efficient ; innovation in the work methods (network and team working), in expressing the need up to the characterisation of the final product. On the whole process this double innovation requires an industrial organisation which emphasises the improvement of quality. Ph. Benoist et al in Review of Progress in QNDE, 14 (eds Plenum Press, New-York, 1995), 2353. P. Calmon, A. Lhémery, J. Nadal, in Review of Progress in QNDE, 15, (eds Plenum Press, New-York, 1996),1019. S. Mahaut, O. Roy, Ph. Benoist, G. Cattiaux, acts of the Congrès COFREND sur les essais non destructifs (Nantes, 1997), 33.